In July 2013, the UK government arranged for a van to drive through parts of London carrying the message 'In the UK illegally? GO HOME or face arrest.' This book tells the story of what happened next. The vans were short-lived, but they were part of an ongoing trend in government-sponsored communication designed to demonstrate toughness on immigration. The authors set out to explore the effects of such performances: on policy, on public debate, on pro-migrant and anti-racist activism, and on the everyday lives of people in Britain. This book presents their findings, and provides insights into the practice of conducting research on such a charged and sensitive topic. 'Go home? makes a timely intervention in debates about the government of immigration in Britain. As well as offering a rich, detailed and evidence based response to racist immigration policies, it is a model for collaborative social research.' Professor Imogen Tyler, Lancaster University 'These are turbulent and terrifying times for minorities and migrants in Britain and across the world. As borders close and new borders emerge in the intimate spaces of everyday life, there is an urgent need for passionate and engaged social research and critique. Go Home? provides a critical intervention - in both senses - into these debates, and poses challenging and uncomfortable questions for us as social researchers, as citizens and as people.' Professor Claire Alexander, University of Manchester 'For too long, Britain's political class has bought into the myth that immigration control can be treated as a technical issue: clean, clinical and kept apart from the messy territory of racism and xenophobia. This study of an important moment of change in official rhetoric - in the authors' words, a "turning point" - explodes that myth and reveals the damage caused by official efforts to seem "tough" on border control. Go Home? is a timely intervention that also points to ways such policies can be resisted.' Daniel Trilling, author of Bloody Nasty People: the Rise of Britain's Far Right 'Go Home? is cutting edge immigration scholarship. It problematizes immigration enforcement and takes an unflinching look at the emotions it generates, going beyond critique to explore new forms of collaborative knowledge production. This is the kind of research, brave, theoretically rich, empirically well grounded, reflexive, that will help to craft new forms of politics and ways of imagining the future' Professor Bridget Anderson, University of Oxford 'No one can forget the chilling but prescient announcement of a new hostile world order for migrants signified in the UK by the 'Go Home' campaign. Through original research, this vital book guides us through the complex but alarming political contours of the campaign and its effects on those least able to defend themselves. This book is a must read for anyone interested in understanding how the anxiety and fear driven politics of border control plays itself out to its logical and devastating conclusion in public discourses and immigration enforcement policies. But perhaps its greatest significance lies in the fact that it gives space to the voices of resistance that continue to keep hope alive in these bleakest of times.' Pragna Patel, Director, Southall Black Sisters 'Go Home? The politics of Immigration Controversies is a thorough and informative publication which provides a distinctive insight into immigration policy and research debates. Operation Vaken should be considered a product of all that which has come before it, this research does well in outlining the current complexities of politics and immigration. 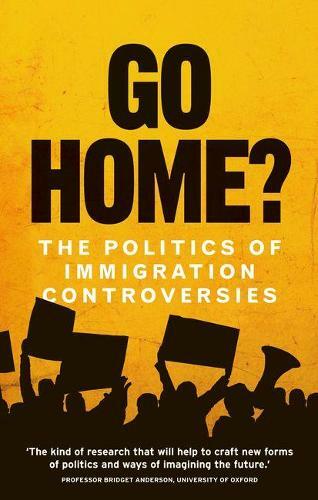 Additionally, this book includes a complete snapshot of society with an engaging and pluralist commentary on the politics of immigration, allowing for meaningful and new conclusions to be made and new ideas to come to the forefront. Meanwhile, the book's honest exploration of the role, limitations and challenges within social research when exploring issues such as immigration will engage other researchers to evaluate and improve techniques.' Samiha Begum, Institute of Race Relations, June 2017 -- .